This is my 24th year participating in the PMC, and my fifth year pedaling to fund a cure for cancer. My inspiration is the memory of my mother, Deborah Barrett, who lost her battle with cancer 9 years ago. It began 13 years prior, when she was diagnosed with Non-Hodgkin’s Lymphoma. The lifesaving treatments that saved her life were developed at Dana Farber and released only two years before her diagnosis. I am so thankful every day for the commitment to funding research that gave my mom 13 more years with us. On October 30, 2008, they told us that mom's cancer had metastasized to other organs. She lost her battle with cancer on January 8, 2009. 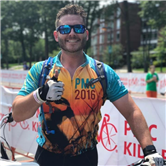 I've committed to raising money for cancer research by riding in the 2018 Pan-Mass Challenge. On August 4th, I will join 6,200 cyclists and ride 190 miles over two days. I ride in memory of Mom, as well as my Uncle Rick and Cousin Michael who also lost battles to this disease. I ride in honor of my mother-in-law, Tammy, as a survivor. This year’s goal is $52 million, and my fundraising goal is $7,500. Please consider supporting me by generously FUNDING a cure for cancer, while I pedal my tail off!